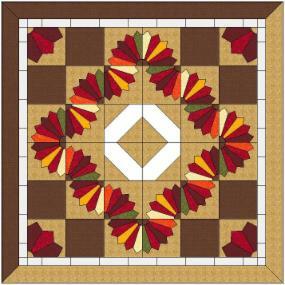 Comm'n Gallery 2 - The Joyous Quilter - Quilts and Patterns For Sale, Commissioned Quilts, Quilt Gallery, Quilting Tips & Tricks, Quilting Green and more! 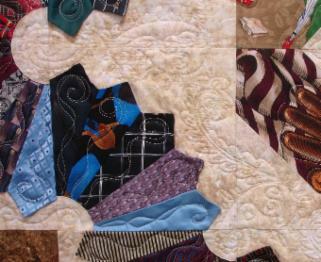 Welcome to the latest gallery of those quilts I have been commissioned to create. I have included detail about each piece, including the specific techniques I may have used, the type of fabrics and the time taken to make each one; many people are surprised to discover just how many hours it takes to make a quilt.. 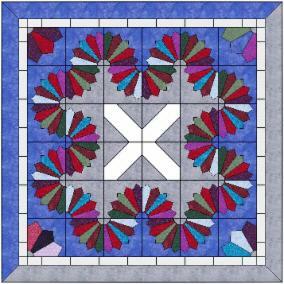 I use Quilt Design software called EQ7 and I've often included a capture of the design. Check out the new section Current Projects page where there are one or two commissions in progress, along with other projects I am currently working on. 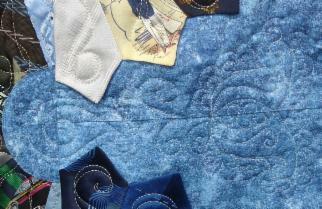 To find out more about how to commission a quilt, click on this link or the Commissions page above. This bright and cheerful quilt was very fun to make and is to be raffled as a fundraiser for a scholarship fund. The wonderful little town of Aromas, CA holds an annual street fair on the last Sunday of August and the whole town turns out. Every year there is a t-shirt available to commemorate the day and twelve had been collected covering a time span of 18 years. 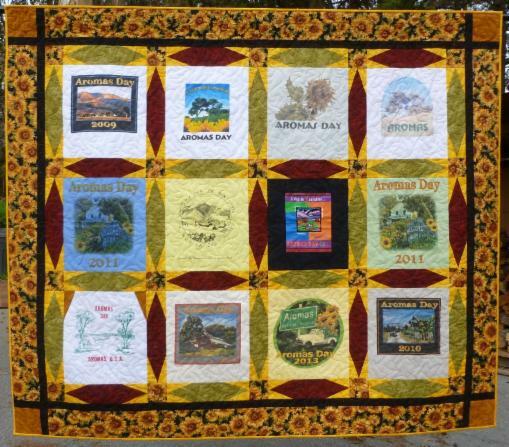 The theme of Aromas Day is often centered around sunflowers, so this had to be the focus fabric of choice. I picked out other colors that emphasized those on the sunflower fabric and then represented the sunflowers further by using the yellow fabric as the pieced ‘petals’ in the sashing. "What a delight it is to have our own "Aromas" quilt! I couldn't be happier with the results. The colors and fabric you picked out far exceeded anything I could have imagined. I am so thankful you were willing to take on the task of making the quilt. It's gorgeous! Thank you." This project presented a fun and interesting challenge as I was using new embroidery software (Floriani Total Control Pro) to make the flower design "applique in the hoop" so that the satin stitching came out consistent and perfect on every flower! The biggest challenge was to hoop everything up correctly so that the blocks were all aligned with each other and the flower was perfectly aligned as the design was too big to be done in one hooping; in fact each block had to be hooped three times, once for the name and once for each half of the flower! But this was a lot faster and more accurate than doing the satin stitching manually, and was fun to do! One of a group of eleven friends from New Jersey recently turned 50 and the other ten friends wanted to celebrate the occasion by having a quilt made for her - what a great group of friends! By the time they found me online, they already had a rough design concept, but weren't sure how this would work out in an actual quilt. As we discussed the concept further, I created several different designs and this one was the favorite. Each friend had chosen two fabrics that they liked, or that meant something about themselves, and subtle neutral colored fabrics were chosen as background. One of the two chosen fabrics, usually the smaller print of the two, was used as the petals and center of the appliquéd flower, beneath which each friends' name was embroidered. The other fabric was placed on the back in the position that matches their position on the front. Various birthday messages were embroidered into the blank blocks on both sides of the quilt, specifically in the typeface Lucida Handwriting. If I have a font loaded on my PC then I can digitize it for embroidery, so most things are possible! "I had some fantastic luck finding Louise, The Joyous Quilter, online. (Thank you, Google search.) From my very first email exchange, Louise was a pleasure to work with. The quilt I asked her to make was a bit of a complicated one, and she not only embraced the complexity -- it actually seemed to make it more fun for her -- but she simplified the whole process at every turn from useful recommendations and options to ordering my selected fabrics. 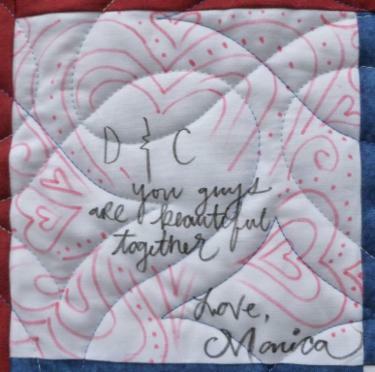 She understood how meaningful this quilt would be, and joyously worked on it as if it were for one of her own friends. She also provided detailed quotes so quickly. Now to the quilt itself. Just beautiful! Her suggested designs, attention to detail and quality of work were all top-notch. It's a gift for a dear friend who will love it forever. Thank you, Louise!" This quilt was made for a Priest who loves to run marathons and has been doing so for a number of years. At each event he attended, he saved the t-shirt and so had quite a collection. He wanted a simply designed quilt for his bed, so warm earthtones in the wonderful Stonehenge fabric collection were chosen. The specification was that the quilt needed to be a certain size in order to fit his bed without hanging over too much, but the motifs on the shirts were quite large. If you look carefully, you'll see that some rows and some columns were narrow, and some wider to accommodate the minimum amount of space on each row or column! The challenge was to fit the motifs into the correct position both vertically and horizontally! 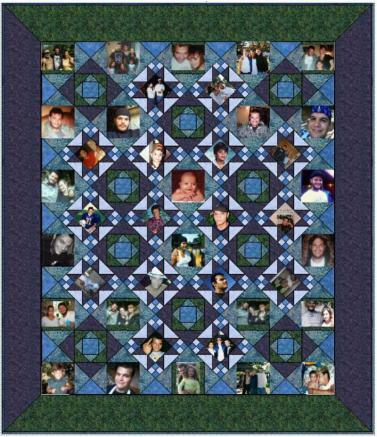 This quilt was made as a tribute to a loving husband who passed away well before his time. 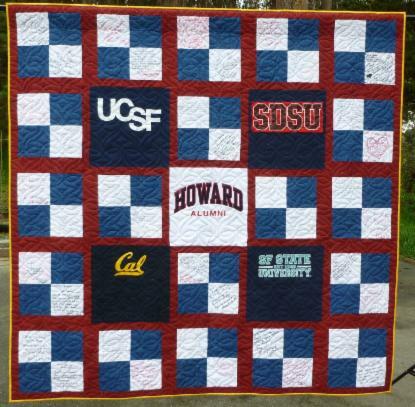 He really appreciated the artistry and creativity in quilting and had a wonderful collection of t-shirts, so it became a fitting tribute to make a quilt from his shirts. There were so many shirts that five of them had to go onto the back, along with a number of favorite photographs. Fortunately the motifs on the t-shirts were mostly dyed rather than printed which makes it possible to make the quilt double sided. Not all t-shirts are suitable for a double sided quilt. Note: the light strip at the top of the back is a temporary sleeve so that the quilt could be hung and photographed. 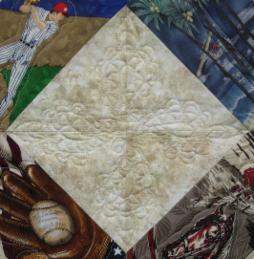 "This quilt was created in memory of my late husband, and is made up of his favorite T-shirts; he had some great ones! Louise is very intuitive and it shows in her work, as she gets emotionally involved with the task at hand. 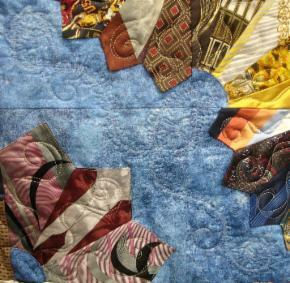 "Joyous Quilter" gets input from her client and then after much thought, the creation begins. I honestly don't think there is anything she can't do! Louise takes great pride in her work & I feel so fortunate to have found her-she was perfect for the creation of this quilt that holds so much emotion for me. Thank you Louise!" Whilst I was making "My Love" above, the same sweet lady who commissioned me to make that quilt, also asked me to make this wallhanging for her best friends' daughters' wedding shower, and I was only too happy to help. This was quite a challenging design to create in EQ7 and, in fact, to let you into a secret, I had to do it in two sections and the image on the right is spliced together ;-) This actually presented an interesting challenge in that the section at the bottom is half a square at a 45 degree angle, so the width of the top section had to equal the hypoteneuse of the bottom triangle and still line everything up! 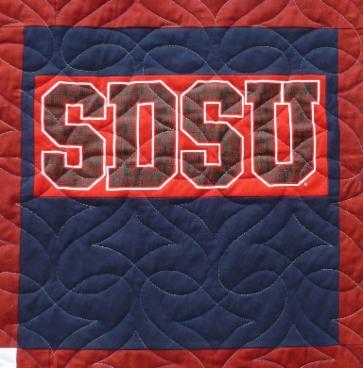 The wording was machine embroidered using a fill pattern, and the outer border and bottom section were created using the Paper Piecing technique. A delightful couple wanted to make a photo quilt for their Granddaughter who has been dancing since she was a little girl. Indeed, the order of the photos is where she was youngest at the bottom of the quilt and oldest at the top. They had already printed the photographs onto fabric, but weren't sure where to go from there...and then they found me. They had already chosen the colorsheme and fabric they wanted to use, and after some discussion the layout design and size was finalised. Here's a fun wedding and t-shirts memory quilt combined. Two young folks who met at college and attended various colleges together recently married and all the white square have messages from the wedding guests written in special permanent, acid-free pens which are suitable for writing on fabric. "Thank you so much for all your help in providing an excellent wedding gift for my daughter, Camille and my new son-in-law. Your suggestions were right on point. You have amazing creativity and it shows in the finished project. Camille and Damien plan on displaying the quilt for all to see. It is truly beautiful!!!" A gentleman came to me with a trash sack full of neckties and wondered if they could be used to make two wallhangings; one for his Mom and one for his sister. The neckties belonged to his father who sadly had passed away a few years previously. He used to be a car salesman and wore a different tie every day and therefore had quite a collection. Immediately I was reminded of the Festival of Light quilt that I helped to make (see September 2009 on page Gallery 2009-10) which had used a Dresden plate design. The 'blades' are like miniature neckties and, depending on the arrangement of the blocks, allow for a number of different design layouts. Below left are the two designs that I came up with using EQ7. The 9" background squares are Stonehenge fabrics which are wonderful neutrals but with some textural interest. The four large white pieces in the center of each wallhanging each have four neckties which have very large pictorial designs. I realized much later that the X and the O in the center of the quilts represented the Hugs and Kisses shorthand used in texting - quite an appropriate and happy accident! 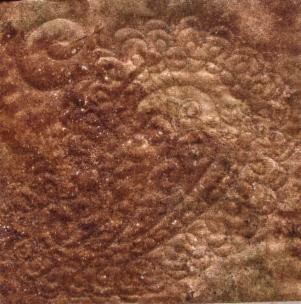 The four blocks in the corners have three slightly larger blades with interesting and unique motifs meriting them being featured. The remaining blades are either plain or have an all over pattern. 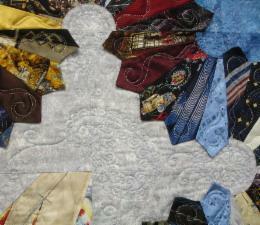 The white border is made from pieces of the many handkerchiefs which matched the ties. Due to the method of construction, the ends, or points, of the ties are not sewn down, thereby providing a '3D' element. This meant that the quilting had to be custom as opposed to a pantograph. This was a fun and interesting opportunity to put into practice many of the things that I recently learned at the Long Arm Machine Quilter's Exposition. Based on Paisley in three different sizes as a basic design element, I enjoyed creating and quilting the designs unique to each quilt. Fabrics: Stonehenge 100% cotton background and ties in silk, rayon and polyester. A young man was tragically cut down in the prime of his life by an accident. This photo quilt is being made to commemorate his life and as a comfort for his Father, commissioned by a good friend of his. The lady who commissioned me very much liked the photo quilt I did before as a wedding anniversary gift (see Happy Anniversary May 2011 on page Commission Gallery 1). We decided on a new, more masculine, color scheme with deep greens and a range of blues from dark to light all in batik fabrics to surround the 36 photographs. Assessing all the blocks; four were 9", nine were 10" and one was 14" and circular! 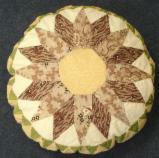 We decided that the round one would be best made into a pillow with the one odd red block on the back. The remaining eight 10" blocks became the center of the bedrunner and the four smaller ones on the outside with additional grey fabric framing each to make them larger. Completing this project, which had been started so long ago by another quilter, was very thought provoking and satisfying. I often thought of her and how she had produced such lovely blocks without all the wonderful tools, gadgets and machines that we have at our disposal these days! I made a seperate pillow stuffer which was slightly smaller than the pillow blocks - this meant that the hand sewn seams of the blocks were not strained with the stuffing. I met a delightful couple a while ago who had a collection of fourteen antique blocks that had been made by hand by Sally's Grandmother in the early 1900's. Firstly they were interested in the names of the blocks so it was fun to do some research on this, helped greatly by the software EQ7 and BB2. As they have Grandmother's wrought iron bed in their guest room it seemed appropriate to use these blocks to make a bedrunner to decorate it. We found two modern day fabrics with tiny prints similar to many of the fabrics in the original blocks, one with a cream background and tiny dark blue print and the other a grey with tiny brown dots. I had enough of each fabric to use the cream for the sashing and the grey for extra background and cornerstones or vice versa. In the end we chose the former as this allowed the original blocks to shine out from the lighter surroundings; as they were the main feature of the whole thing, this was important. 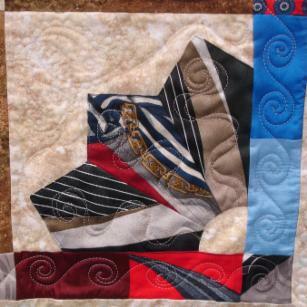 The quilting was minimalistic so as not to overwhelm the blocks - stitch in the ditch was done around the main feature of each block and then tramlines in the sashing. Fabrics: Antique blocks sashed with 100% cotton. Quilting: Freemotion, "stitch in the ditch"
"An Aromas Country Garden Tour featuring Art in the Garden, brought us together. We met the Joyous Quilter, Louise, at one of the featured homes. When we viewed her quilting artwork, which was lovely and varied, I thought of my Grandmother’s quilt squares which I had stored for years and years. Our conversation began that day, and continued through several months, deciding how we might best use the very old pieces. Louise suggested a bed-runner and pillow, because we have my Grandparents original bed and dresser. They were designed by Louise with our input... not an easy task because the quilt pieces were of varied sizes. She amazingly made them all work together! The resulting bed-runner and pillow are lovely, and we feel that whatever project my Grandmother began so many years ago has finally been completed... a lovely feeling, and will be enjoyed for years to come." This was an interesting little project away from regular quilting; I was asked to recreate a baby blankie that was lost some years before. The fabrics were a gorgeous silk for the front and back and a wonderful satin for the ruffle. In order to replicate the original, only one side was to be quilted and the other had a sweet and personal message embroidered in a lilac embroidery thread. The silk fabric was very expensive and so I approached both the quilting and the embroidery with a little trepidation, however, these parts of the projects went very smoothly. The ruffle on the other hand presented somewhat of a challenge because the fabric frayed alarmingly! In the end I used a ruffler gadget borrowed from my quilting buddy who has the same sewing machine as I. Once the ruffle was applied by machine on one side, it took me two days to invisibly hand sew the ruffle onto the other side! Phew! 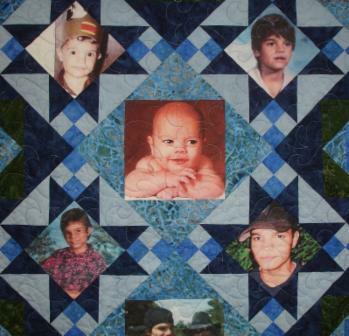 "The recreated "lost" baby quilt was a huge hit. Actually to say it was a huge hit is to diminish the emotional impact the little quilt had on my daughter. She burst into tears and said, "Oh Mom. . . "
I know it was tricky to make and I appreciate your willingness to persevere and also your willingness to work with me to recreate a particular "feel" and look. The little quilt is just beautiful beyond words. My daughter is very happy and very grateful to have something so similar to the original back in her hands. Thank you for your hard work and bless you for your skill and artistry!" Early in the new year I was contacted and asked if I could make a quilt in 2 days!! Hmmm! After discussing the project this thankfully stretched to 10, although I delivered in 9! 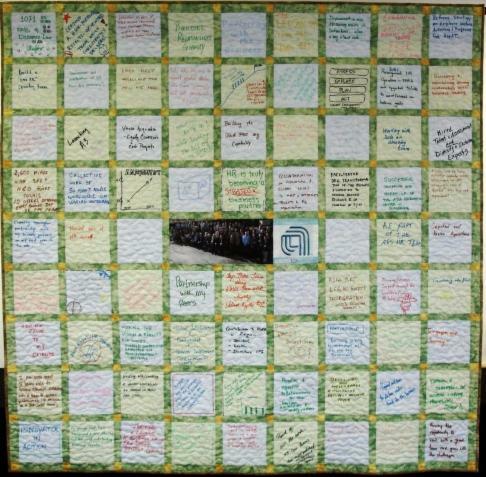 A Silicon Valley company was having a teambuilding conference and wanted the attendees to write affirmations on fabric squares and have these made into a quilt to commemorate the occasion. Within 90 minutes I designed the quilt according to their specifications, providing a few different options from which to choose. Within a day we had the fabric chosen (via email and photos!) and the squares prepared and delivered. Two days later the written on squares were returned to me, and in the mean time I had prepared the sashing and cornerstones. 48 hours later it was on my quilt frame - what a whirlwind! This certainly got the new year off to a flying start! In addition to the squares they had a group photo taken which they wanted included on the quilt. It was too large for one sheet of Printed Treasures photo fabric, so I managed to find a spot where there was a gap between folks so that no-one’s face had a seam through the middle! We also added the company logo with the conference name and date; I manipulated the two until they fit perfectly into the gap 3 squares and two sashing strips would otherwise occupy and I was very pleased with the result. It was quilted with the Crazy Puzzle pattern which, to me, indicated interlinking / collaboration / collective and so on which I felt went well with the overall theme of the conference. 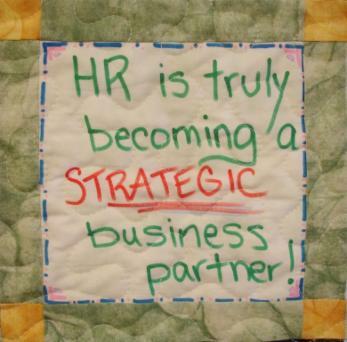 "Thank you for all your help with our HR Collaboration quilt project. With very little input you managed to provide us with multiple design ideas, fabric suggestions and pricing options. I’m still amazed how quickly you delivered the fabric squares needed for the project and just as fast, turned it into a finished product all within our required deadline. Your creativity and amazing quilting skills turned our team building project into a beautiful quilt."